In 2015 the Central Victorian Greenhouse Alliance (CVGA) delivered Stage One of a collective solar bulk-buy and installation project. Designed for rural Victorian councils, the Alliance provided an in-depth analysis of the viability and financial return associated with solar on Council-owned roofs across ten shires (and two Alliances). Stage One was funded through CVGA membership fees as well as by direct co-contributions from participating councils and cost approximately $110,000. The model was designed to share and reduce anticipated project risks, maximise CVGA staff utilisation rates and ensure effective returns to project participants. By sourcing hardware from a bulk supplier and using local installers, the project will provide the greatest cost benefit and keep the physical work within the boundaries of local councils. Stage Two is currently awaiting confirmation from participating Councils regarding funding commitments for installation. Evaluate council buildings for suitability and costs of solar power. Guides the project through the collective procurement and installation of solar systems. The CVGA delivered reports to all participating Councils outlining an analysis of the most suitable buildings, optimal-scale solar systems for these premises and estimated ROI and payback as well as the CO2 savings that would be generated by the installation. With Stage 1 complete and member councils having approved the feasibility results, the CVGA is awaiting confirmation of funding commitments to proceed setting up a steering committee to drive the project forward. CVGA will facilitate the selection of a Lead Council for the project and work on creating a procurement process that adheres to local government sector best practice. Procurement, implementation and delivery of the project (alongside other project details) will be developed and finalised through the steering committee. Once finalised project commencement dates will be finalised and announced and the next phase will be green lit. By running a single procurement process and sourcing hardware from a bulk supplier and using local installers the project will provide the greatest cost benefit and keep the physical work within the boundaries of local councils. 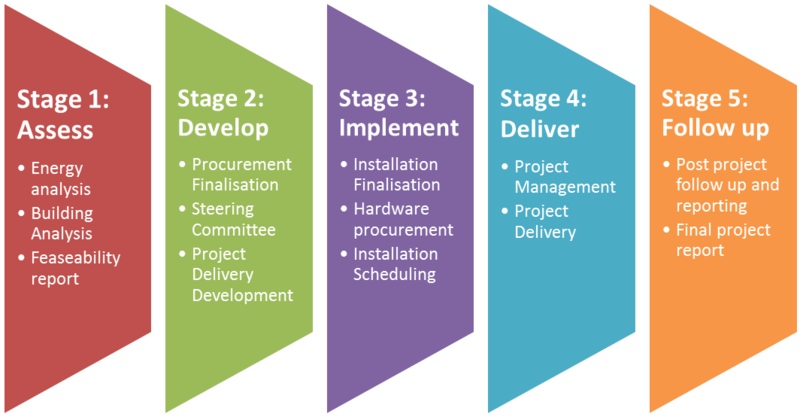 Stage 5: Follow up:The CVGA will provide a project wrap-up report analysing the strengths and weaknesses of the project.